The theme park’s owner said the new attraction will “copper-fasten the future of Tayto Park”. 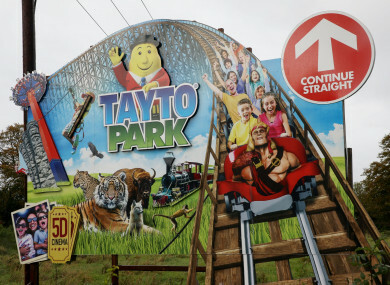 IRELAND’S LARGEST THEME park, Tayto Park is to lodge a planning application for its biggest attraction to date, an ‘iconic’ €14 million steel roller-coaster ride in the coming days. Owner of Tayto Park, Ray Coyle said today that the new roller-coaster will be the same height as the park’s 32 metre high Cú Chulainn but will be 400 metres longer that the 1,082 metre long CúChulainn ride. Coyle said that the new roller-coaster “will copper-fasten the future of Tayto Park”. The new roller-coaster will be two roller-coasters in one. It will be a first for Europe and ensure the future of the park. If you don’t create something landmark every three of four years, your numbers will start going down and that is the road to closure. Coyle said that the plans for the roller-coaster will be lodged with Meath County Council next week. Coyle said that the aim is to secure planning in 2019, build the roller-coaster in 2020 and open it to the public in 2021. He confirmed that the cost of the roller-coaster will be €14 million and will be able to accommodate 1,200 passengers per hour compared to the Cú Chulainn carrying 1,000 passengers per hour. Coyle was commenting as new accounts for Tayto Park which show that last year it recorded an 8% rise in pre-tax profits to €3.65 million. This followed revenues increasing by 5% to €17.533 million – or an average of €92,770 a day in revenues for each of the 189 days Tayto Park was open last year. Coyle confirmed that 720,000 visitors came to Tayto Park last year and this year numbers will increase by around 3-4% in spite of numbers down for the month of July due to the hot spell. Coyle said that Tayto Park’s Earnings Before Interest Depreciation Tax and Amortisation (EBITDA) are €7 million for last year. Coyle said that he was “delighted” with the performance of Tayto Park in 2017 and 2018. Coyle opened Tayto Park “in a field in Co Meath” in October 2010. Nobody came for six months. I thought we would have to close it down but in the Easter of 2011 people started to come. You learn as you go along. He said that the most popular attraction is the all wood Cú Chulainn roller coaster which opened in 2015. He said that 40% of visitors go to the Zoo at Tayto Park with 35% doing the tour of the Tayto factory. Coyle also stated that Tayto Park receives a very strong trade from Northern Ireland accounting for 24-25% of all customers. Coyle said that the park has been adding incrementally to its attractions each year. The park has also been a strong employer in the local area – the 2017 accounts show that numbers employed last year totalled 296 with staff costs of €4.4 million. Tayto Park’s post tax profits last year were €3.1 million after paying corporation tax of €549,402. The company’s assets had a book value of €33.48 million at the end of last year. Email “Tayto Park is seeking planning permission for a new 'iconic' €14 million roller-coaster”. Feedback on “Tayto Park is seeking planning permission for a new 'iconic' €14 million roller-coaster”.